Oh yes - the weekend. And even better, Äiti is going to be home for a week. Yeeehaaaa. That's her cheering too. She has a few 'study days'. Because she has to get educated to get a permanent job here, she is allowed to have paid leave for a few days a year to study. She thinks this is immensely civilised: we think it's a great opportunity for us to have more attention. She thinks she's going to study. We think otherwise! This is an impressive photo of you, Punapippuri. 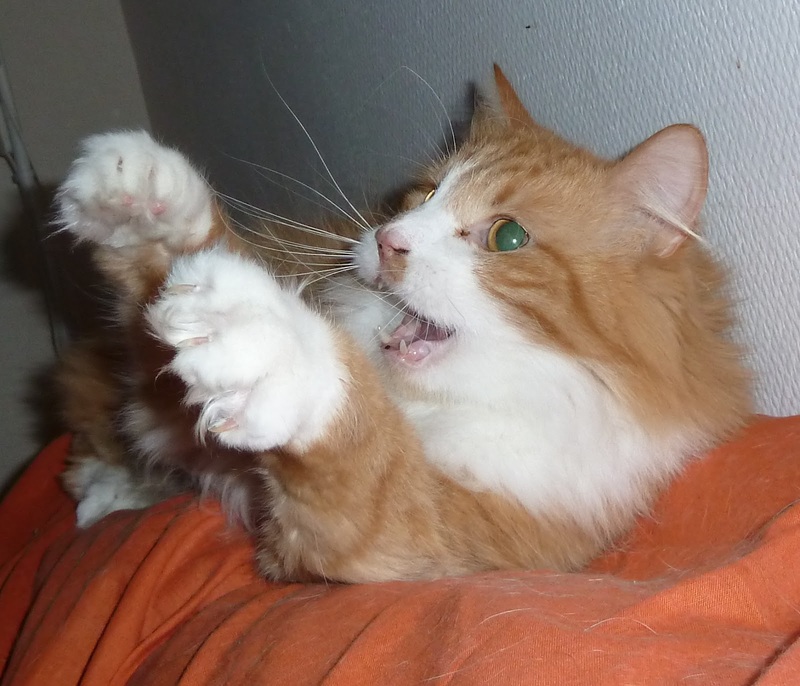 Those mighty claws of doom are displayed prominently fur anybody who might threaten your kingdom! Mom says she finds it quite adorable. Study? With all of you to take care of and keep entertained??? HA-HA-HA-HA-HA! A lovely picture of a mighty king! How nice to have Äiti home for a whole week. If her studying keeps her away from playing with you, you can always lie down on her books or laptop. Look at those fluffy feeties! Adorable!